Cards by Rita: FM36: Brrrr! Baby, it IS cold outside! Brrrr!!! It has been in the 30s the last few nights and that is super cold for us Texans! 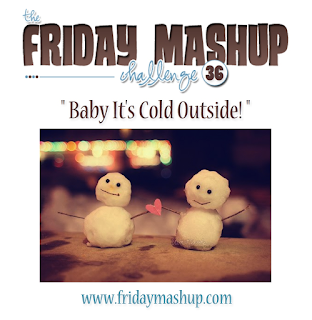 It is time for a new challenge at The Friday Mashup! Kim is our hostess this week and challenged us with a set of fun colors and snowmen! Guess who LOVES SNOWMEN???!!!!! ME!!!!!!!!!!! As you can see, I cheated a bit and didn't mash it up this week. I got a box full of new Stampin' Up! goodies on Tuesday and I just had to cut into my new paper! Isn't it gorgeous? Best of all? It was free! Gotta love Sale-a-bration, especially when it comes early for us demonstrators! :) I hope snowmen can be vintage 'cause mine is trying his best to be! I think he's rockin' the look; do you? The snowman looks wonderful backed up by the new gorgeous DSP! 32 degrees here - perfect snowman weather! Such a fantastic card, love all the patterns that you've used. I love this card, the green just pulls me right in, and of course the snowman is adorable! VERY cute! I still have to do my preorder...now I am getting anxious! That dsp is wonderful! I love how you colored your snowman, and spritzed around him...very cute!! That is fabulous!! I just have to get up the courage to hit submit on my really big preorder....I keep thinking I will wait...but then I see something and think nah, Christmas gifts for me! Thanks for the enabling! Very cute snowman, love the paper you used too. 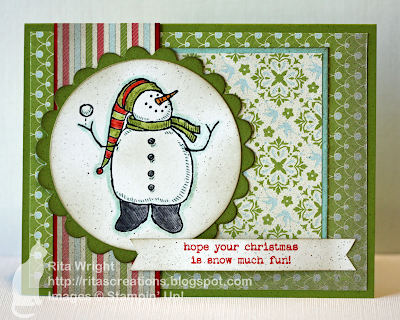 I wouldn't have thought of green for a snowman card, but I love it! This is so gorgeous Rita! I love the way you've used the dsp and that snowman is awesome! You've definitely made it look vintage, I love it!